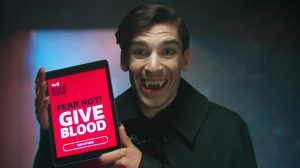 Creative agency 23red has secured a partnership between ITV2 and NHS Blood and Transplant which will see Love Island stars front a campaign to attract young blood donors. The Love Islanders will form the ITV2 Blood Squad to help quell young people’s fears about blood donation and encourage them to register and book an appointment at a local donation centre. In a poll of 1,000 adults, the fear of giving blood was considered scarier than public speaking, heights and going to the dentist, with the main barrier being a fear of needles. But NHS Blood and Transplant needs 600 new donors every day to replace people that can no longer donate, so it’s vital that they engage with a younger audience to break down barriers to blood donation. 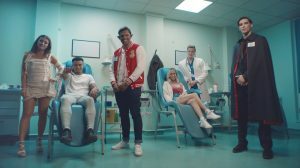 Having been introduced by 23red, ITV2 secured some of their biggest talent names to work with NHSBT – Love Island stars Dani Dyer, Jack Fincham, Wes Nelson, Dr Alex George and Laura Anderson – and to star as the ITV2 Blood Squad in a series of Halloween-themed promos and other social content made by ITV Creative to take the fear out of blood donation this Halloween. Launched on the 17th October, the ITV2 Blood Squad will be directing people to a bespoke ITV2 landing page where people can view additional content including myth-busting videos featuring the ITV2 Blood Squad as well a click through to register to become a blood donor.